The first thing you need to do is download Malwarebytes from our download page. Scroll down and click Malwarebytes. You will be prompted to "Run" or "Save" file. Select "Save" and save file to your desktop. The file you have downloaded will be named mbam-setup-1.46.exe or similar. To install Malwarebytes, all you have to do double-click on the file, select "Run" and the installation program will start . You can go with the default settings here and just click your way through the installer by using the Next button. 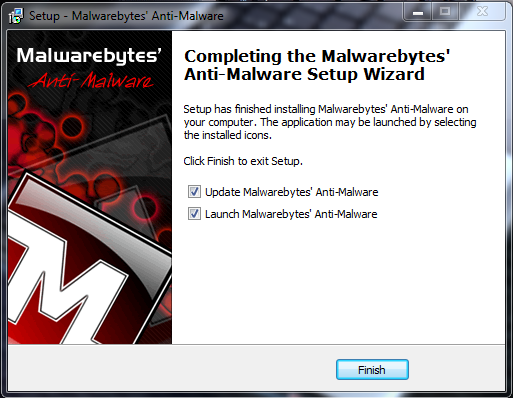 Make sure you leave both the Update Malwarebytes' Anti-Malware and Launch Malwarebytes' Anti-Malware checked. Then click on the Finish button. MBAM will now automatically start and you will see a message stating that you should update the program before performing a scan. As MBAM will automatically update itself after the install, you can press the OK button to close that box and you will now be at the main program. You should click on the OK button to close the message box and continue with the removal process. You will now be back at the main Scanner screen. At this point you should click on the Show Results button. A screen displaying all the malware that the program found will be shown as seen in the image below. Please note that the infections found may be different than what is shown in the image. You should now click on the Remove Selected button to remove all the listed malware. MBAM will now delete all of the files and registry keys and add them to the programs quarantine. When removing the files, MBAM may require a reboot in order to remove some of them. If it displays a message stating that it needs to reboot, please allow it to do so. Once your computer has rebooted, and you are logged in, please continue with the rest of the steps. 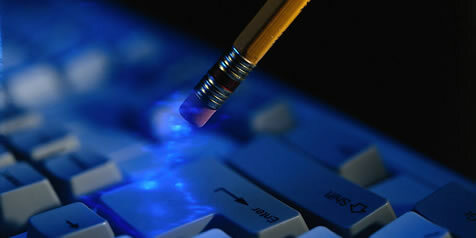 When MBAM has finished removing the malware, it will open the scan log and display it in Notepad. Review the log as desired, and then close the Notepad window. You can now exit the MBAM program.